It wasn't Dr. John Hamish Watson who wrote the books about his companion Sherlock Holmes, even though you might think so if you read the books about the famous detective. The true author was the Scot Arthur Conan Doyle, born in 1859. Six years after his birth, he wrote his first story. Like so many other authors, he read everything he could find. But the library allowed him to borrow only one book at a time, so he had to return to the library several times in one day. Like Watson, Conan Doyle was a doctor. While studying to become a doctor, he found himself in a class where the lecturer was Dr Joseph Bell. It was Bell who became Conan Doyle's inspiration when he wrote the stories about Sherlock Holmes. Bell taught his students how to use their eyes, ears, brain, and perception to find out what problems their patients had. Bell thought that you could treat someone who's sick by understanding the small details that differed the sick from the healthy. It turned out that Bell could find out more about his patients by just looking at them compared with Conan Doyle who had to ask them questions. Conan Doyle didn't make much money by working as a doctor - he made more money from selling his stories to magazines. Almost no patients visited him because an unwritten rule among doctors said they weren't allowed to advertise. But he could use the time to write stories. He had tried to publish several of his stories, but was rejected until 1879 when a magazine published "The Mystery of Sasassa Valley." The story was unrelated to Sherlock Holmes, and he would soon publish 25 more stories. But Conan Doyle didn't become famous because the magazines didn't allow him to publish his stories with his real name. Conan Doyle had to write a book - not a short story. He finished a book in 1885, but it was rejected by the publishing houses. Another book was lost in the mail on its way to the publisher. Conan Doyle had learned a lot from his first two books and was ready to try a third time. He wanted to write a book about a detective. He recalled his old lecturer Bell and came up with a detective who could solve cases by observing details. The name of this detective was Sherrinford Holmes, named after the American doctor Oliver Wendell Holmes. Conan Doyle would later change the name to Sherlock Holmes in the following 56 shorter stories and 4 books about the detective. Conan Doyle carried with him a notebook that he filled with thoughts about stories he wanted to write. He found these thoughts while walking, riding a bike, and when playing cricket or tennis. He always added tiny details and loose thoughts that in the future could become a real story. To this notebook, he added all the books he read and he also found inspiration from these books. He found inspiration to the language and story in his books from authors like Robert Louis Stevenson, Bret Harte, and Charles Dickens. Conan Doyle couldn't visit London, so he took a map of London and made up the stories. He never visited the now famous Baker Street in London and was surprised when he met a fan who had found the real address. He liked to include details in the books from his own life. It could be the name of a town where a relative lived, a topic he had discussed, or a book he had read. While writing a story about Sherlock Holmes, Conan Doyle began with the end. When he made up a name on a character in the story, he could forget the name after a few pages and just left a blank area because he didn't have the time to go back and look up the name. Conan Doyle wrote about 3000 words each day. He began after breakfast and ended at five to eight o'clock in the evening. He could write in a room filled with talking people or on the train. To save time, he tried to not lift the pen from the paper, and he also let his sister write on a typewrite what Conan Doyle had written on a paper. He often forgot the details, so the Sherlock Holmes books are filled with factual errors. The story can jump several months in time even though only a day has passed. 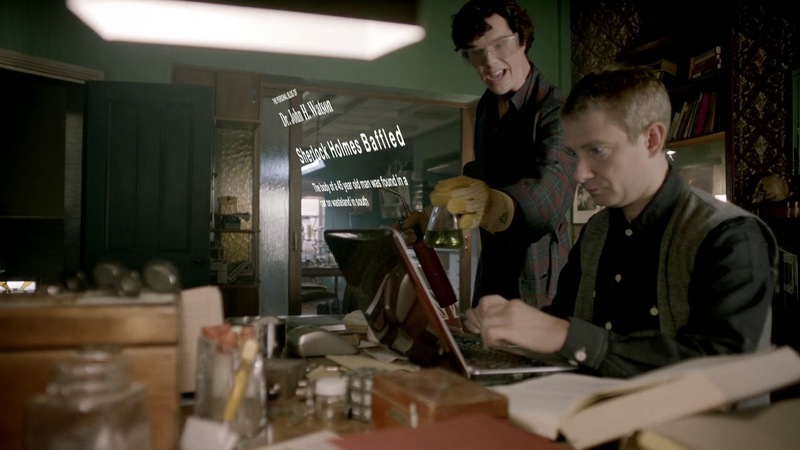 This could actually have helped Sherlock Holmes to become famous since certain fans tend to read the books several times to find these different errors.